Many sections of this site will draw attention to the fact that you must always take a map with you when on the hill. Coupled with having a map when you set off is ensuring that it stays with you throughout the day, and remains in a legible state that you can read it until the point you make it to safety. For this, a map case is essential. Rain (or other precipitation) will ensure that an unenclosed map will end up as a soggy pulp, rendering it useless. Inability to navigate under such circumstances would be pretty embarrassing, especially if you had to be rescued. A map case that has a fold over waterproof seal will save you the embarrassment. Having a map neatly sealed in a case will prevent it from becoming soggy and illegible, but won't prevent it from blowing away. 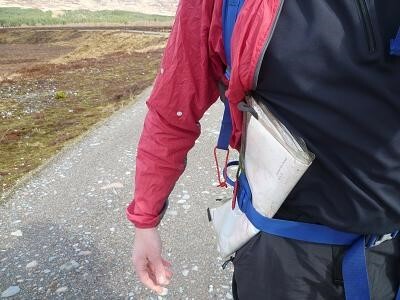 Even if your map is strapped to the side of your rucksack or held under an elastic bungee (which isn't navigational best practice), there is the possibility that it will become loose and fall from your rucksack. It happens. 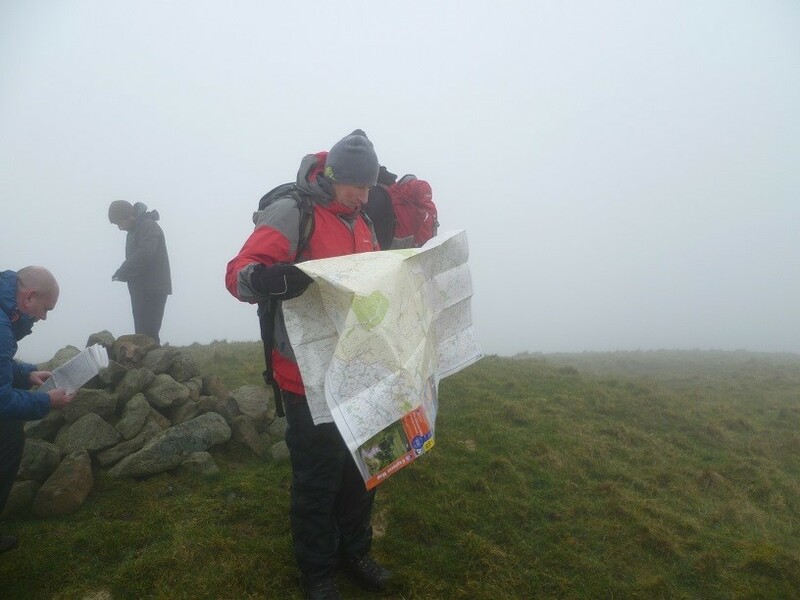 Prevent your map blowing away by always having it fastened to your rucksack by a piece of cord. The cord will need to be long enough for you use the map unimpeded, but not too long that it gets in the way, causing other hazards. For this reason it's important that your map case has at least two fitments that will allow permanent fixing of the safety cord, with those fitments being solid enough not to fail if your map is caught in a high wind, flapping about for a few seconds, and restrained by the safety cord until you catch it. A further safeguard for map security is to attach the safety cord in two places on the map case, and thence to your rucksack. Tie one end of the cord to the case with a secure knot, then further secure it by attaching - with a secure knot - the same cord to another fitment on the case, with the long end of the cord being attached to your rucksack (by a small 'gear' karabiner if you have one). Should one fitment fail, you have one remaining. Some map cases come with neck strap attachments, but it's not recommended that you use these. If it's windy, one hand will be permanently fixed to the case preventing it from twisting and turning and strangulating you! Map ready to hand but not flapping around your neck. 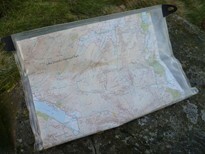 The Ordnance Survey produce a range of laminated maps, thus making them immune to becoming soggy through getting wet. However, laminated maps do not make them immune from being blown away, thus the advice is not to bother with these more expensive maps, but stick to paper maps secured in a map case as described above. The same advice is true for maps printed from computer programs such as memory map. Always keep in a map case rather than just laminating. There are many ways these days of printing your high quality maps for a trip to the hills. If you do take your own printed maps, do make sure that you have them in a maps case, for all of the reasons shown above, i.e it won't turn to a suggy pulp or blow away. When you fold your map and put it in a case, make sure that you can see numbers associated with grid lines. If you can't, write a few onto the map before folding, so that you don't have to risk getting your map out of the case when on the hill in the situation of your needing to use a grid reference. The size of case depends to an extent on the scale of map used and the distance travelled. Try to fold the map so that the whole day's route is visible, possibly with some clever map folding for a long route to allow the case to be turned over and show a further part of the route. Carrying a 1:25,000 and walking a long way will lead to the potential for a mid-walk map re-fold, which should be avoided, as even a light wind will mean folding becomes extremely difficult. In such cases, one could argue that a large map case is most appropriate. Carrying a 1:50,000 map will mean a smaller case is required. In all cases, the case should not be too big and cumbersome as to prevent effective map use or quick reference. Avoid mid-walk map re-folds - a small breeze will make folding virtually impossible.